So, summer may be on it’s way out, but say goodbye in style with a great take on the Mint-based Kentucky classic! 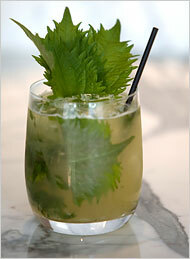 Muddle 3 shiso leaves in a glass with 1 ounce lime juice and 1 ounce simple syrup. Add 3 ounces Maker’s Mark or any other fine Bourbon, shake with ice, and top with a bit of club soda.